Davenport Evans lawyers joined volunteers from across the Sioux Empire today filling sandbags for Sioux Falls flood relief. Sioux Falls area residents are preparing for increased flood risks this weekend, due to rising river levels. The City of Sioux Falls has organized a sandbag-filling station at Sherman Park. The station is to the north of the Great Plains Zoo, off the corner of 13th Street and Kiwanis Avenue. Residents can obtain 25 empty bags per vehicle, free of charge. Volunteers may sign up to help fill sand bags from 8 a.m. to 8 p.m. daily, by calling the 2-1-1 Helpline Center. Click here for more information on the City of Sioux Falls sandbag filling station. 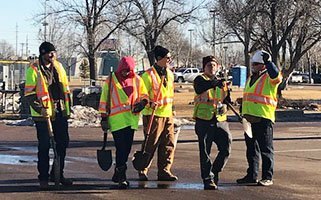 Click on the following link for complete information from the City of Sioux Falls regarding Flood Management Updates and Tips, including sections on: Flood Threat, Sandbags, Levee Information, Public Information, Help and Volunteer, Pets, All Residents, Parks and more. City officials are also setting up three public sandbagging drop off locations. They are at Sherman, Riverdale and Tomar Parks. The drop off sites open at 8 a.m. Saturday and will run to 7 p.m. until April 13.